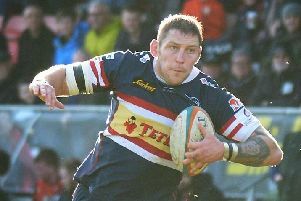 Michael Hills, pictured in action against Worcester last September. Looking back to our first British & Irish Cup game against Cross Keys in October, it is fantastic to recall the elation we felt after winning that game. This has been replicated with each game that has passed, as we managed to win all six of our group games and then see off Munster A and Bristol in the knockout stages. We have made history for the club by reaching the final on our own home turf, the first time Doncaster have reached a national cup final. It is an honour and a privilege to lead and be part of such an amazing team. The coaching staff have had the right vision and drive to get us there. Having a home final at Castle Park is a huge and momentous occasion not just for us as players and staff but also for our supporters who have been instrumental in our success. The support has been exceptional and the Doncaster presence has been felt, appreciated and most certainly heard at all our games this year both in the British and Irish Cup and the Championship. The feeling around the club this week is a mixture of excitement and nerves but there is a definite buzz in camp as we gear up for Friday. We know it is going to be a tough encounter playing against a quality outfit like Worcester, whose aim will be to do the double this year. But as a team we remain confident that we can produce a strong performance and deliver the right result to get our hands on the cup. On a personal note, to lead the team out of the tunnel on Friday will be extra special for me. I started my journey in rugby at six years old playing for Doncaster and have always had my heart here.